Cumbres & Toltec Scenic Railroad to Offer One More 2018 Sunset Dinner Train – Sept. 15th! 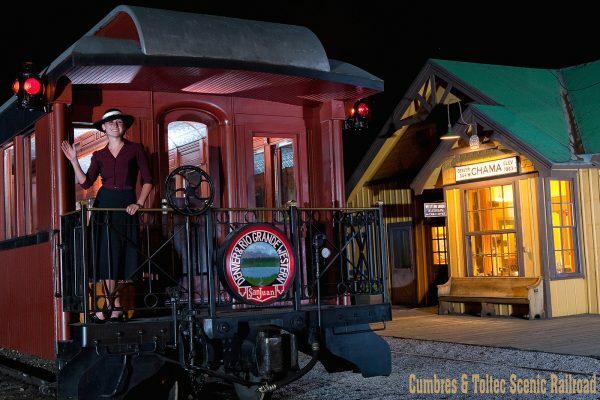 Each month, the Cumbres & Toltec Scenic Railroad offers a Sunset Dinner Train. This special excursion allows you to experience a Rocky Mountain sunset, a gourmet dinner and the thrill of railroading under the stars. These trains often sell out due to the delicious meal, the unique experience of traveling by steam train at night and the fun entertainment and lively atmosphere. The September Dinner Train on September 15th features an intriguing Murder Mystery theme and optional pre-WWII Paris Costume Theme. Enjoy dinner on Cumbres Pass and music by El Norteno, with French “flair.” You will feel like you are at Rick’s Café on this special evening, which is also in the height of fall colors, so a lovely way to experience the beauty of autumn in the setting sun. Dinner rides are extremely popular and often sell out, so book early to avoid disappointment!